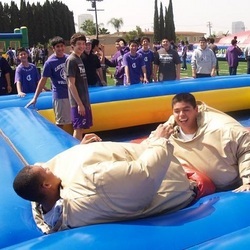 Team Building - Interact Event Productions - Corporate Event Planning at Wholesale Prices! Challenges require participating teams to go compete in up to 5 different kinetic, social, physical and intellectual challenges for various parts for their bike, bundle, basket, etc. We can customize just about anything you want to BUILD! Just give us your ideas and we will personally customize this challenge around it. This challenge is completely versatile and can be done indoors or outdoors. Discovery Team Building Challenges with GPS Devices. Great for large groups, fun and outdoors, develops social networking the old fashion way. 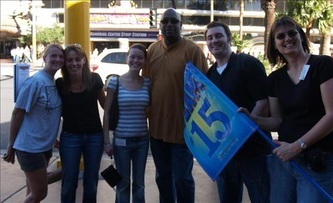 This team building activity works like a scavenger hunt. Participants will follow the clues in their custom discovery booklet, they will follow clues, riddles and challenges that take them from each GPS location until the first team completes the entire course! Participants will be broken up into various team and compete to design, build and race their own River Raft. This challenge can be scaled down to table size version where participants would complete the same series of challenges on a much smaller scale. This team building challenge can be completed outdoors with a swimming pool or indoors with a kiddie wading pool. 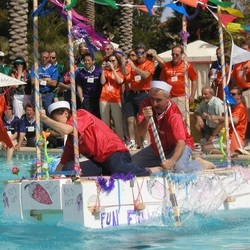 Either way, teams are challenged to come together in unity to design, build, and race (which means it has to float) their raft. Its not as easy as it seems, there are so many factors to account for when designing your raft to float. Great for large groups! 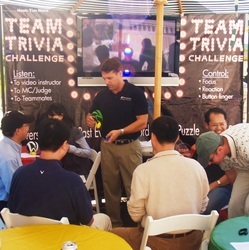 A real Hollywood-style Game Show with professional host, stage, sound and customized trivia. Contestants will participate in a game show challenge of trivia (customized) and multiple kinetic, social and intellectual challenges. 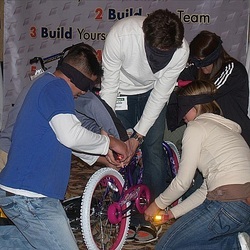 This team building challenge can be completed indoors or outdoors, we provide everything you need (except the people). Totally Customizable trivia questions for your employees/team. Over the years we have serviced many companies, including Microsoft, Boeing, Intel, NIKE, Starbucks and many others! Our standards are high, our packages are always budget (no surprises! ), and we stand behind all our work! 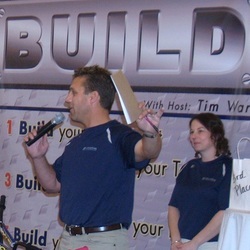 Give us a call, we will customize a Team Building Event to your exact demographics, budget and venue.